Silence the distressing sound of clanking metal pipes—and banish any worries about damaged plumbing—with one simple installation. Have you ever been spooked by strange banging, clanking, or thumping sounds coming from your water pipes whenever you flush a toilet or finish a load in the dishwasher? No need to call in the ghost hunters. The cause of these startling sounds commonly goes by the name of “water hammer,” although it’s also known as hydraulic shock. Both names refer to a pressure surge that results when flowing water is forced to stop or change direction suddenly when a valve closes at an end of a pipeline system. While the eerie noises may conjure up images of the supernatural, the problems this pressure wave can cause are all too real, ranging from vibration to a partial pipe collapse. Water hammer plagues many homes, but—lucky for you—it’s easy to address. Homeowners often first notice water hammer issues soon after the installation of a new water-using appliance, such as a washing machine, dishwasher, or ice maker; the addition of any of these heavy water users may cause uneven pressure throughout the plumbing system. If the cushion of shock-absorbing air that is typically contained by your plumbing’s vertical air chambers is depleted, then the water rushing through your pipes will slam into the fixtures without something to soften the blow. As soon as you hear the telltale banging or clanking, try to equalize the air distribution throughout the system. Start by closing the main valve that supplies the house with water, and then open the faucet that sits highest in the house, for example, the sink faucet in the top-floor bathroom. Head downstairs and turn on the faucet that sits lowest in the house (perhaps the basement sink). Finally, flush all the toilets. As the water drains, air replaces it throughout the system—exactly what needs to happen in order to quiet the water hammer. When water stops draining from that lowest faucet and you’ve emptied the entire system, shut off the faucets and reopen the main valve to let water reenter. If this equalization process does not stop the banging and thumping, check the water pressure. A high household water pressure will create more hammering and knocking noises. You can test the water pressure by screwing a pressure gauge onto an exterior hose bib or behind the washing machine. The magic number is 75 psi—more than that, and you’ll want to call a professional to install or replace a pressure regulator. Less than that, however, means that your household water pressure is within normal limits and you need to look elsewhere for a solution. 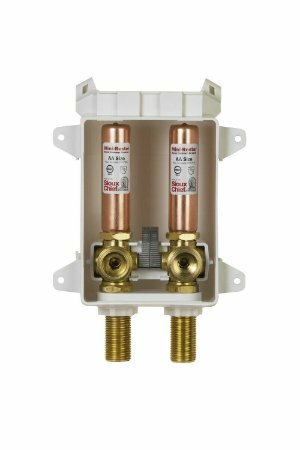 Daniel O’Brian, a technical expert from online retailer SupplyHouse.com, recommends a solution that’s readily available and not terribly difficult to install: a water hammer arrester. This regulator fits right into a home’s plumbing system to absorb the shock, stop the banging, and ultimately prevent pipe damage. When water and all the force behind it has no place to go, the arrester, using either a piston or air bladder, takes the hit—the air in the bladder compresses, slowing down and stifling the noise triggered by the water. According to O’Brian, today’s market includes a range of types and sizes of water hammer arresters, most of which are simple enough for typical homeowners to install themselves. Some models for sinks and toilets screw directly onto the outlet of the stop valve and hook up to the riser; others are designed to attach to appliances like dishwashers and washing machines. Even larger models can regulate multiple fixtures using a rechargeable air bladder, but these units usually require professional installation. Whatever your needs and budget, experts at SupplyHouse.com are ready to help you sift through the wealth of options—including those from industry-leading brands like Sioux Chief, Dahl, and Watts—to find the right model for your household. Getting that proper unit into position may spare you from both the unsettling noises and any larger plumbing problems that might have been coming down the pipeline.